Looking for a reliable and hassle-free digital thermometer for your baby and the entire family? Then Baymore Health’s Digital Baby Forehead and Ear Infrared Thermometer is the one for you. As a parent, you do your best to make sure that your family is always in good shape. However, you can’t always prevent them from feeling under the weather. The good thing is you can be prepared to care for them when such time comes. Equip yourself with the right thermometer. Choosing a thermometer that’s best for your family can be overwhelming because of the plethora of options in the market today. To avoid confusion, always settle for something that is safe, accurate, and straightforward to use – like our digital baby forehead and ear infrared thermometer. With this handheld thermometer gun you won’t need to double or triple check your child’s temperature. Results are always consistent and reliable without any effort. Our clinically tested thermometer uses advanced yet passive infrared technology so the safety of your family is guaranteed. 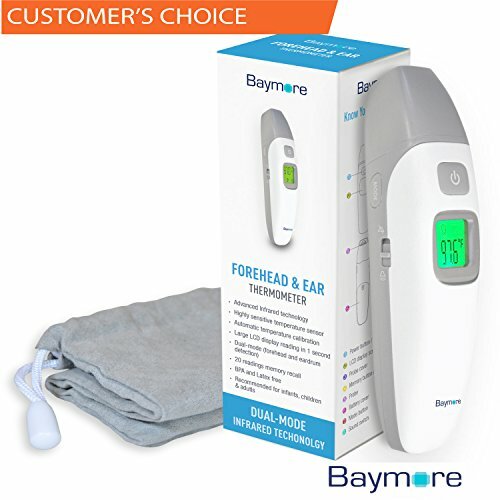 Get your Baymore Health’s Digital Baby Forehead and Ear Infrared Thermometer today. Purchase with peace of mind with our money back guarantee and one year warranty! ACCURATE AND INSTANT READINGS: Our digital thermometer features an automatic temperature calibration to ensure high accuracy all the time. The highly sensitive temperature sensor also makes it possible to deliver fast temperature readings via a large LCD, making it easy to read results even in the dark. RELIABLE AND SAFE: Has advanced yet passive infrared technology so it’s safe to use. FDA approved and clinically tested to ensure its consistency and reliability. Trusted by pediatricians and medical professionals for premium health care monitoring. Suitable for home and workplace use. COMPACT AND EASY TO USE: Very simple to operate. Provides the most practical way to take and monitor body temperature. Suitable for all age groups – from newborn babies, toddlers, to adults. DUAL MODE: Has forehead and ear mode so you can easily switch to your desired method. Can display readings in either Fahrenheit or Celsius. Also comes with a fever alarm and allows you to retrieve the last 20 readings. MONEY BACK GUARANTEE AND WARRANTY: Your satisfaction is our top priority. We stand by the quality of our product so it comes with a 30-day 100% no questions asked money back guarantee. In addition to this you are covered by the 1 year manufacturer’s guarantee. Lightweight and quick temperature read My toddler is always on the go so I was surprised in two clicks I was able to get a quick and accurate read. i like how it can measure ear forehead and room temperature compact and small. i like how it can measure ear forehead and room temperature. Every Mom Needs One of These Forehead Thermometers! This quick-draw forehead thermometer is lightweight and runs on 2 AAA batteries. It captures a temperature super fast. It’s perfect for kids and a really great all-around essential tool for every family. I bought one for home and one for our travel kit.